Hessel are now able to offer an instant Globalmobility™ account that can be used to place corporate funds anywhere, instantly and on demand. 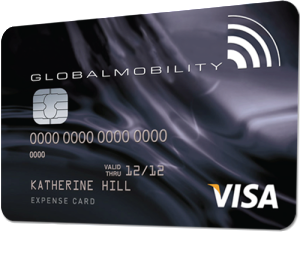 The account can make direct payments or can be used to feed a Globalmobility™ prepaid Visa card so giving access to immediate direct debit card payments. You can Use the Globalmobility™ account and card to give your assignees a ‘soft landing’ in their host country until their own banking arrangements are regularised. The Globalmobility™ account can deliver a lump sum or allowance payments to empower your assignees by letting them make their own choices on timing and relocation expenditure. You have complete control and access to all the expenditure data for global tax and compliance. The Globalmobility™ account and card allows you to put corporate funds into the hands of your service providers, or distant cost centre managers, regularising those ad-hoc payments. This means no more of those disappearing benefits for the assignee that never make it onto the international tax return. As the Globalmobility™ account and card are a part of an integrated relocation expense management solution from Hessel, you can be sure that you will have full access to total data for complete reconciliation of expenditure, cost centre recharging and compliance reporting. Perhaps the biggest global financial management problem is making safe, timely and accountable international payments. It is difficult as expenditure inevitably takes place in another country, where you may not have your own team in place to expedite matters. It comes down to loss of control. Often the only way to get things done quickly is to ask the assignee to use their own money to get things paid. It’s not good, and runs counter to the nature of the deal that you did with the employee when they took on the assignment (see assignee experience). Plus, you don’t really have a proper system in place to reimburse non-business expenses. So you are continually creating exceptional processes. Of course you could ask your service provider in the country to handle things and bill you for it. But that is probably out of scope with your supplier agreement. This means even more loss of control and accounting issues caused by exceptional processes. Suppliers obviously don’t like this because it often feels like corporate bullying, and surprises make global mobility financial planning and management all but impossible. Prepayments can regularise this area of global mobility expense management and make sure that you have your hands on the purse strings at all times. Prepayment empowers assignees, making them feel secure that they won’t run out of money by letting them have more autonomy and involved choices. Treating them like grown-ups in fact – which works wonders for global talent management. The same goes for relocation service providers. Putting accountable corporate funds into their hands gives them all the tools they need to make safe, planned and timely payments on your behalf. The reduced strain on their cash flow could actually keep them in business, making you their most valued client. Prepayment is a win for everyone.